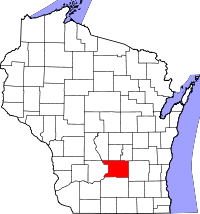 Columbia County is a county located in the U.S. state of Wisconsin. As of the 2010 census, the population was 56,833. Its county seat and largest city is Portage. The county was created in 1846 as part of Wisconsin Territory. According to the U.S. Census Bureau, the county has a total area of 796 square miles (2,060 km2), of which 766 square miles (1,980 km2) is land and 30 square miles (78 km2) (3.8%) is water. The county's highest point is in the Baraboo Range, near Durward's Glen at 1,480 feet above sea level. 94C - Gilbert Field airport serves the county and surrounding communities. C47 - Portage Municipal Airport supports the county. As of the census of 2000, there were 52,468 people, 20,439 households, and 14,164 families residing in the county. The population density was 68 people per square mile (26/km²). There were 22,685 housing units at an average density of 29 per square mile (11/km²). The racial makeup of the county was 97.18% White, 0.88% Black or African American, 0.35% Native American, 0.33% Asian, 0.02% Pacific Islander, 0.44% from other races, and 0.79% from two or more races. 1.58% of the population were Hispanic or Latino of any race. 46.4% were of German, 10.2% Norwegian, 7.8% Irish, 6.4% English and 5.0% United States or American ancestry. There were 20,439 households out of which 32.20% had children under the age of 18 living with them, 58.10% were married couples living together, 7.40% had a female householder with no husband present, and 30.70% were non-families. 25.50% of all households were made up of individuals and 11.00% had someone living alone who was 65 years of age or older. The average household size was 2.49 and the average family size was 2.99. In the county, the population was spread out with 25.20% under the age of 18, 7.10% from 18 to 24, 29.90% from 25 to 44, 23.40% from 45 to 64, and 14.40% who were 65 years of age or older. The median age was 38 years. For every 100 females, there were 101.60 males. For every 100 females age 18 and over, there were 100.40 males. For most of its history, Columbia County voters have backed the Republican Party candidate in national elections. Prior to 1992, the only times Republicans failed to win the county in the preceding 100 years of presidential elections were in the midst of a divided party vote in 1912, the presence of Wisconsinite Robert La Follette on the ballot in 1924, & national Democratic Party landslides in 1932, 1936, & 1964. From 1992 onward, the county has been a Democratic-leaning swing county, voting for the statewide winner in all presidential elections since then except 2004 & the national winner in all except 2000. Republican Donald Trump won the county in 2016, though a majority of county residents voted for Tammy Baldwin's re-election campaign for the U.S. Senate two years later in 2018. ^ a b "State & County QuickFacts". United States Census Bureau. Retrieved January 18, 2014. ^ "Wisconsin: Individual County Chronologies". Wisconsin Atlas of Historical County Boundaries. The Newberry Library. 2007. Retrieved August 13, 2015. ^ Wisconsin High Points. Wisconsin State Cartographer's Office. The History of Columbia County, Wisconsin. Chicago: Western Historical Company, 1880. Memorial and Biographical Record and Illustrated Compendium of Biography ... of Columbia, Sauk and Adams counties, Wisconsin.... Chicago: Geo. A. Ogle, 1901.